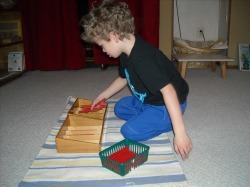 Quality Montessori education at its best! The Children's House of Rochester is a preschool/daycare that offers a Montessori education for children ages 2.8-5 years of age. The education provided will focus on the five senses which will allow exploration in a safe and fun environment. The Children's House of Rochester focuses on the child's abilities and independence. The classroom will offer areas focused on language, mathematics, science, geography, art, sensorial and practical life. Limited space available. Contact Heather Gjervik at 507-398-5378.